What a FANTASTIC weekend! I checked two things off my Thai bucket list that I have been wanting to do since arriving in Bangkok: a cooking class, and a Thai massage. 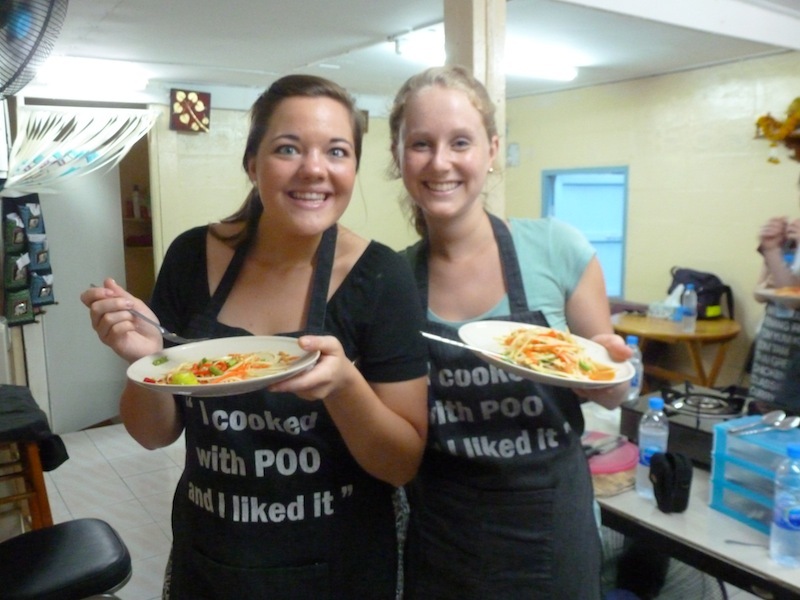 This morning I cooked with Poo and it was fantastic! Poo is an incredible Thai woman living in one of Bangkok’s slums, Khlong Toei. She was given a microfinance loan through the “Helping Hands” organization, and using that loan she has become incredibly successful operating her cooking school. 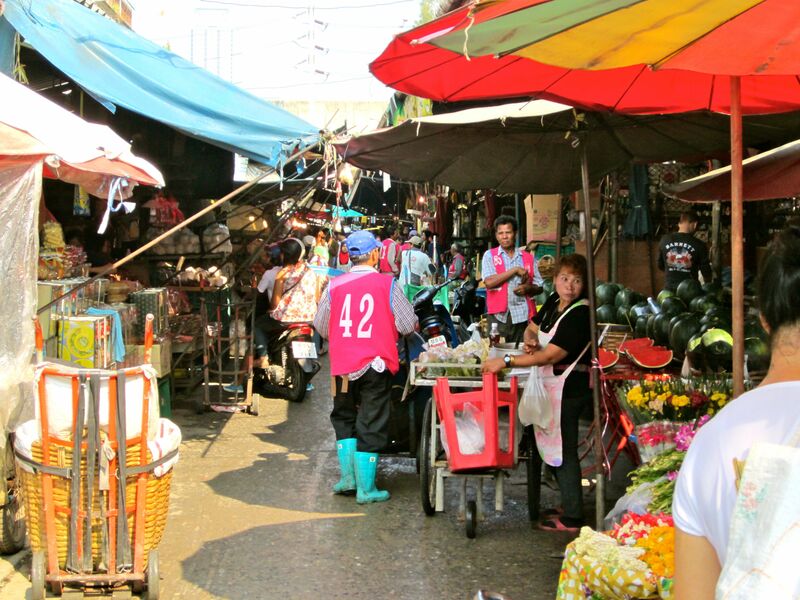 The morning started off with a small tour of Klong Toei’s market. It is an extensive market with everything and anything you could imagine. We started by going through what Poo called the “Issan” area. Issan is a Northeastern province in Thailand, and the food there is quite different than the food in Bangkok. That row of the market has everything and anything strange you could imagine: live frogs, skinned frogs with hearts still beating, an endless assortment of bugs, eels, catfish, cow innards, skinned chickens etc… I did not once breathe in through my nose that entire walk. The rest of the market contained more “normal” items – beef, vegetables, and every possible exotic fruit. Poo explained that most stall owners start work at 2am, and don’t stop until 6pm, they only way they can scrape by to make a living. This market is incredibly cheap and has a wide variety of foods. As a result it is the source of product for many of the street vendors and many of the hotels in Bangkok. What an experience! The second portion of the morning was the actual cooking. 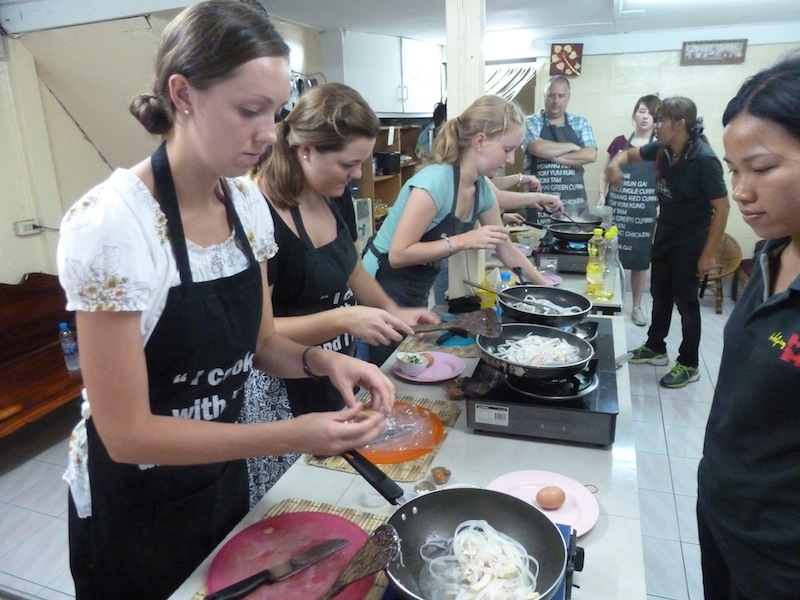 The class is not meant to transform you into a Thai chef, but it gives a nice introduction to basic Thai dishes and lets you cook your own portion each time. We cooked three dishes: Som Tham (papaya salad), Tom Yam (a delicious spicy soup with many different flavors), and Pad Thai. The food was delicious, and now that we know how easy it is to make these foods it is definitely something I will take back to the US with me. The only obstacle in the US: trying to find all of the ingredients. What was most fascinating to me, is realizing what goes into the dishes I have been eating all semester. For example, one of the strongest flavors in Tom Yam soup, comes from lime leaves. Before putting the lime leaves into the pot, we broke the leaves apart which emitted the strongest and most delicious smell. All the taste from this dish comes from breaking a green leaf apart–AMAZING! Part of the fun of the experience was Poo herself. She is a hilarious and kind woman, with completely broken English, yet she is sweet, enthusiastic, and eager to share her story, and the story of Klong Toei. She explained to us that following her great success, she has also seen a change in the people in her community, and deliberately tries to uplift them as well. 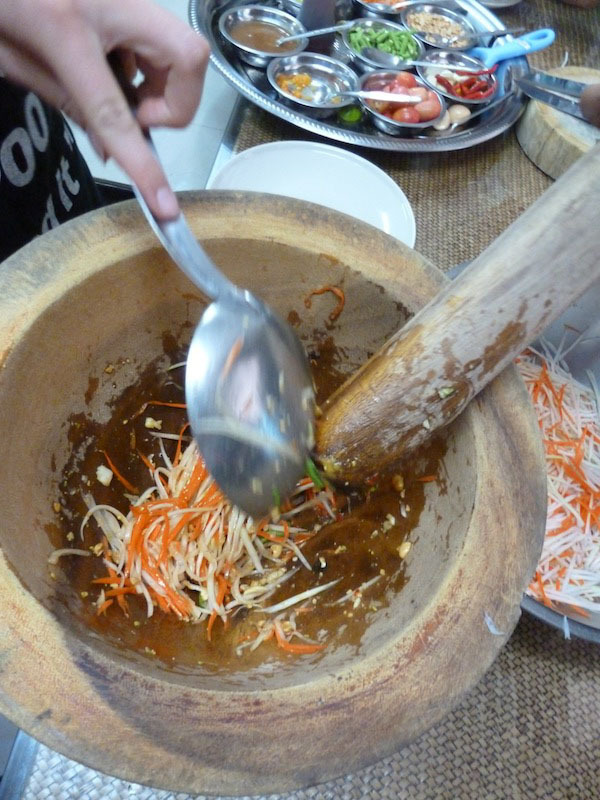 For example, some of the ingredients we used to cook were handed to us in small cups made of banana leaves. Poo said she purchased these from a woman in her community who is very sick and strapped for cash, so she thought she could help her by buying her product. For each need of her business, Poo employs a member of her community, and tries to evenly distribute where she buys things so that as many people in the community can benefit from her success. It truly is an incredible project. The other event of the weekend was getting a Thai Massage: two hours for $12. Yes, really, it’s that cheap. But my goodness, that was a massage like nothing I have ever experienced. First of all, I was in pain the first 45 minutes. My masseuse literally dug her feet/fingers/hands into ever inch of my leg, almost as if she was trying to separate every muscle fiber. Because the massage is two hours, the women can thoroughly cover every part of your body. They also stretch you in every which way which was quite intense, because they completely ignore whether you are flexible or not. They are also very hands on – you are lying on a mattress, and they sometimes use their whole bodies, for example contorting you around them to stretch you. Not necessarily relaxing in the same way as a typical massage, but I certainly feel like I had a work out! Our fantastic evening massage ended with some Thai tea, before heading home. I have to say I feel so content after such a fantastic long weekend. Yes, some people may complain that Bangkok is crowded, or that the city is too dirty and smells bad, but I love the fact that there is never a dull moment in Bangkok: there is always something new to do, something to learn, and something incredible to experience, and I LOVE it! This entry was posted on Monday, April 23rd, 2012 at 11:57 am and is filed under Samantha in Thailand, Spring 2012. You can follow any responses to this entry through the RSS 2.0 feed. You can leave a response, or trackback from your own site.